PM Modi called the opposition's alliance a “jamghat” (crowd) of "family-ruled parties", saying those unable to win over the people are resorting to violence. 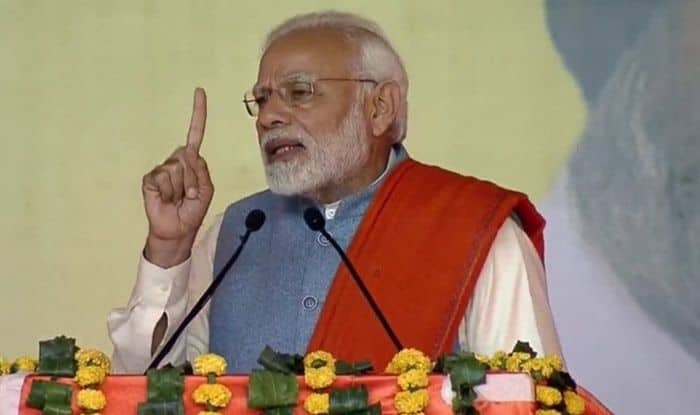 New Delhi: Prime Minister Narendra Modi on Monday launched an all-out offensive against N Chandrababu Naidu saying that the Andhra Pradesh Chief Minister was so fixated with the rise of his son that he does not realise how his policies and corruption can lead to the sunset of the state. “The CM is so fixated with the rise of his son that he does not realise how his policies and corruption can lead to sunset of the state. To set the son, he (Naidu) is creating an atmosphere for the sunset of the state. He is promoting only his son, he is forgetting the sons and daughters of the state,” said PM Modi, while addressing BJP workers from Anantapur, Kadapa, Kurnool, Narasaraopet and Tirupati in Andhra Pradesh via video conferencing. Responding to complaints made by BJP leaders of threats being issued by Andhra Pradesh Chief Minister N Chandrababu Naidu to BJP workers, the prime minister said that it was a “direct outcome” of “nervousness and insecurity” (of the TDP chief). PM Modi called the opposition’s alliance a “jamghat” (crowd) of “family-ruled parties”, saying those unable to win over the people are resorting to violence. “Nowadays in the country, those who are unable to get into the people’s hearts, and whom the people are not ready to accept, are adopting a violent path. Everyday, our workers are getting killed in Kerala. But still, our workers are not deterred. In AP too, there are atrocities against BJP workers,” he said. Furthering his attack on the Andhra Pradesh CM, who has been playing a pivotal role in bringing the anti-BJP parties under one roof for the proposed Congress-led ‘mahagathbandhan’ (grand alliance), PM Modi said that Naidu is daydreaming of becoming Prime Minister and alleged that he backstabbed TDP founder and his father-in-law N. T. Rama Rao twice. “For BJP what matter is the passion to serve Bharat Mata. In some parties what matters is a family. In others, what matters is one’s fortune. And for many others, both family and fortune matter,” he said. PM Modi urged party workers to make friends with the “foot soldiers” of the media and asked to talk to them, even beyond press meets. PM Modi also warned opposition parties to never underestimate the power of BJP workers. PM Modi said that Naidu is daydreaming of becoming PM and alleged that he backstabbed TDP founder and his father-in-law N. T. Rama Rao twice.